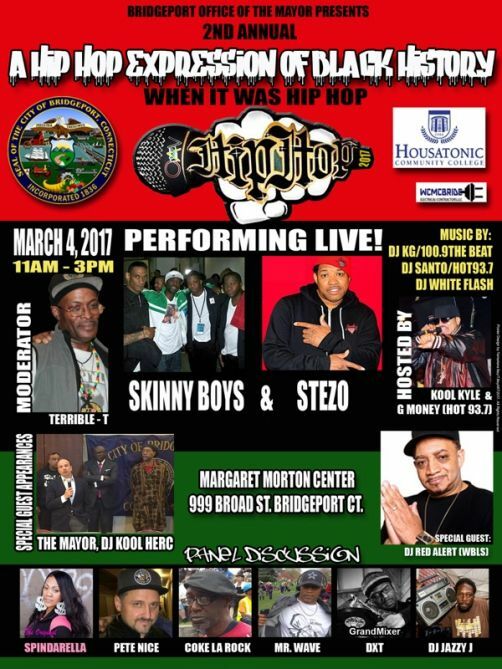 BRIDGEPORT, Conn. - March 3, 2017 - PRLog -- The Mayor Joseph P "Joe" Ganim is proud to present its 2nd annual A Hip Hop Expression of Black History... When it was Hip Hop on Saturday March 4, 2017 from 11AM-3PM. This is a free event at the Margaret Morton Center. Hosted by Kool Kyle and G Money of Hot 93.7 guests include DJ Red Alert of WBLS, Spindarella, Skinny Boys, Stezo, DJ Jazzy J, Mr. Wave, Coke La Rock, Pete Nice, Terrible T, DXT, DJ Kool Herc with proclamations given to those who kept Hip Hop in the print spotlight such as Belinda Trotter-James, Editor with the Word Up! publication house whose titles included 2 Hype, Rap Masters, Hype Hair and Try It Yourself Hair. This is the second annual day of Hip Hop presented by the Mayor of Connecticut, Joseph P "Joe" Ganim. The event will also include panel discussions on the culture and history of Hip Hop. Come and join the fun with photo opportunities and information along with live performances from some of your favorite hip hop performers from back in the day when hip hop was in its infancy phase. Full Figured Women Are Not Going To Be Ignored!